The Saturday spin is here again – it’s especially early this time around, isn’t it? This week, the Wheel of Time gave me 20 MINUTES to knock out a drawing. This was a space I’d been looking forward to tackling, with it being the halfway house between the 15 MINUTES and 30 MINUTES exercises, whose results saw quite a difference in quality. I’m skipping the Reddit bit this week, as I didn’t find a spooky-goofy Halloween one that took my fancy, which was a bit of a shame – I expect they’ll appear in flood-loads now that I’ve done something else. I did actually do one of a chap in goggles and surgical mask covered in blood, but indeed thought that a little too gruesome to post. 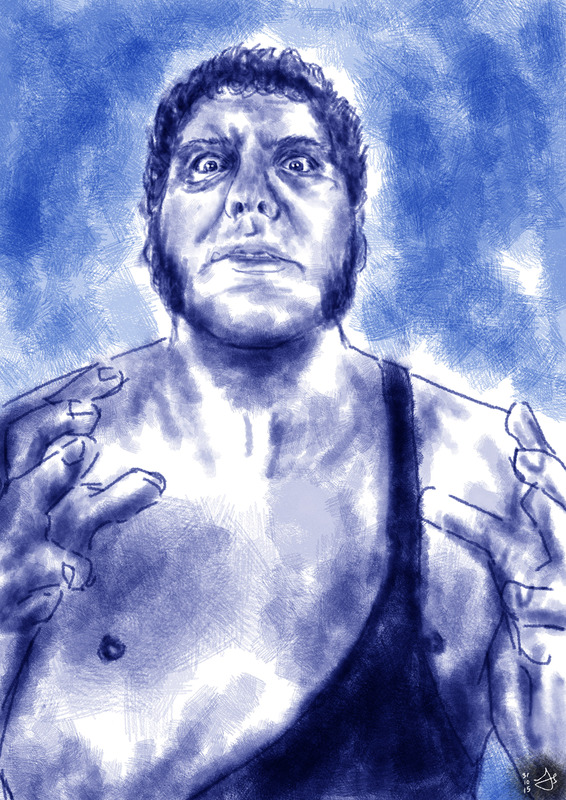 So, I just went to the scariest guy I could think of: André the Giant, of course, looking most unhappy, and clearly coming for you. I’ve sketched André countless times over the years. I love to do so, as I find him a captivating subject for obvious reasons, however, I’ve never tried this swiftly before, so it was sure to be interesting. I used the same brush that I used on Mini Me – I wish I could say through design, but actually it was just because I forgot to switch back before starting to draw. The colour overlay doesn’t make it darker as I hoped it would, but it makes the image as a whole look better than it probably deserves, softening the variation in skin tone and thus appearing smoother, though visibly there are strokes which stick out like a sore thumb – I’m not entirely sure what’s going on around the clavicle, but it was over too quickly to fret about such things. I was going like a madman on this, to be honest, partly because of the time limit, and equally just because of the time! I’m quite chuffed with the face, though – it has a markedly different feel to my normal plan of attack, and that’s pleasing! Well, that’s time up for another week – back to Reddit victims next week! I’m the one on the left, if you’re wondering. With the very kind response to my Time-Tested challenge of a child, I decided to have a go at another kid (drawing, you understand, rather than yelling). With that, I thought it most appropriate to just go to, reputedly, the biggest kid of all: me! This is oneself, circa two years old, actually not watching Countdown or playing Scrabble, and instead enjoying some quality time with one of my most treasured companions. I had him for about fifteen years, and yet, I don’t think I ever named him. 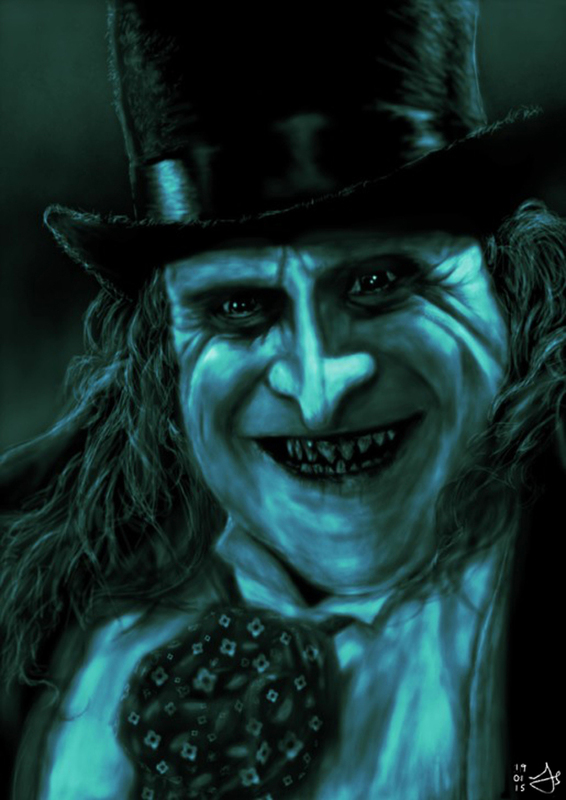 He was so cool, though; you squeezed his belly and, on release, he’d let out this raucous, strident roar. It used to drive everyone but me completely crazy, which of course only compelled me to do it more. And yes, those ears. Weren’t they something? I think I’ve instinctively shrunk them a little, actually – they probably ought to have been a touch larger. I believe today they’re roughly around the same size – I just grew into them. I used a newly-concocted brush here – a rougher and more textured preset, in an attempt to lead to a suitably naive finish. I’m not sure I let myself go as much as I would have liked with it – you can see elements of it coming through, but I think I got a bit scared mid-piece and reverted to how I normally work for the most part. I fear mini me would scowl and propel his beloved toy at me with some force if he were here – he wouldn’t have been so bashful. It’s why children will always be the most genuine artists: all play, no fear. Make like your two-year old self and be bold, be daring! Just be sure to wear a more tasteful jumper. Yeesh. This is another from the archive. 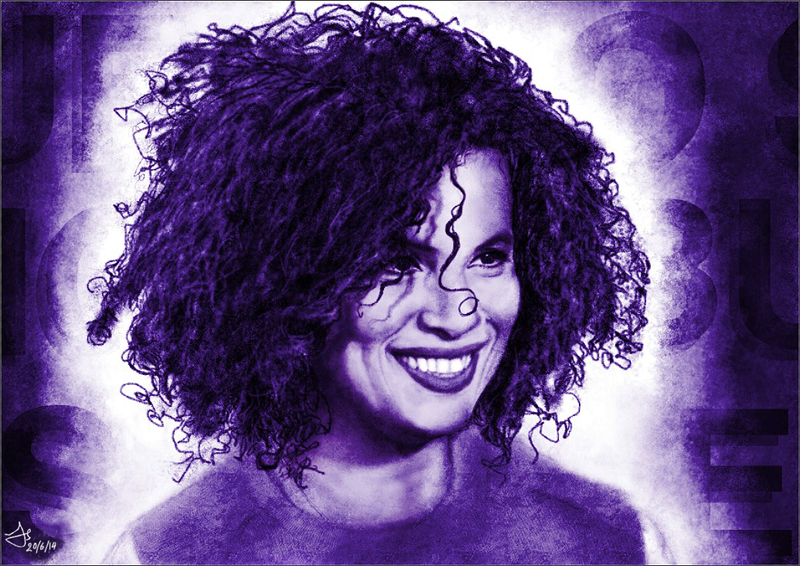 Here we have the marvellous and so very cool Neneh Cherry. 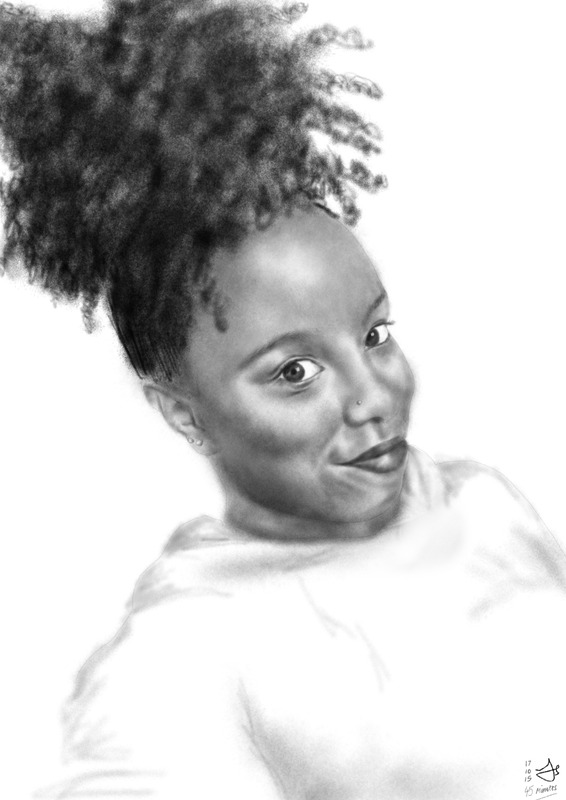 I drew her last year, partly as I wanted to try and do that amazing hair justice, but primarily because it was around the twentieth anniversary of 7 Seconds – which she sang, with the celebrated and eccentric African musician Youssou N’Dour – being in the charts. It’s one of my absolute favourites – a challenging song brought to us by two beautiful voices. It topped the charts around Europe, but I hasten to shoot the British of 1994 a disappointed glare in reading that the song did not reach number one here, peaking at number three. I presume number one at the time was Love Is All Around by Wet Wet Wet, which genuinely stayed there for about fifteen years. Or did it just seem that long? With all this in mind, quite why I plastered Buffalo Stance across the background when it was clearly 7 Seconds I was harking back to, I’ve no idea, but I quite like the effect of the type itself. Did you know Neneh was inspiration for Lara Croft, heroine of the Tomb Raider series of games and films? Well, you do now! Jeepers! Someone’s ready for trick or treats a week early! 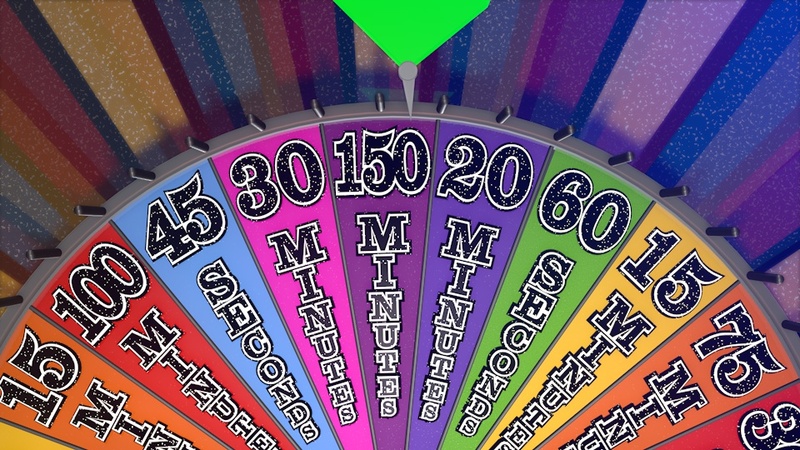 Another Saturday, another spin of the wheel – this time around, it gifted me 150 MINUTES to work with a volunteer of Reddit Gets Drawn. 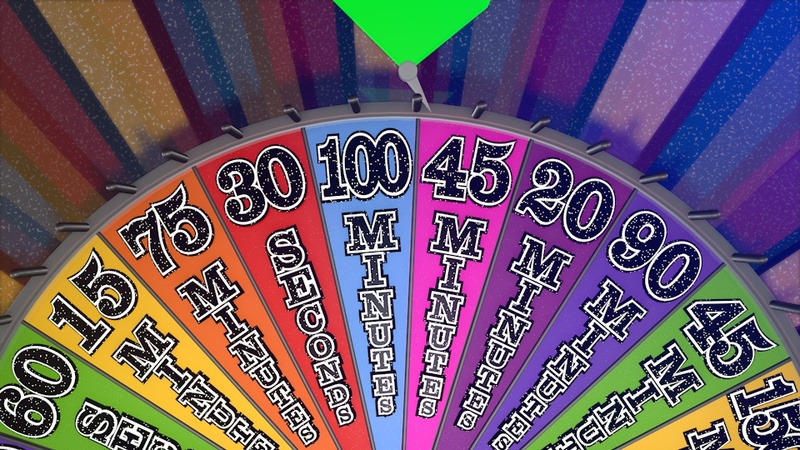 I was initially a little indifferent about this; it’s really the smaller times I’m looking forward to more now, which, I grant you, is quite a departure from when I constructed the wheel and was pining for as long as possible with each spin. But still, we must respect the wheel, and the choices it makes through no volition of its own. Who knows, I might go into it all complacent and PAY FOR IT. WHAT DRAMA AND SUSPENSE THIS CONCEPT OFFERS. With almost three hours feeling positively pedestrian to me now (at least on Saturdays), I decided to go for a full body portrait, and this adorable photograph leapt out at me for pretty obvious reasons. 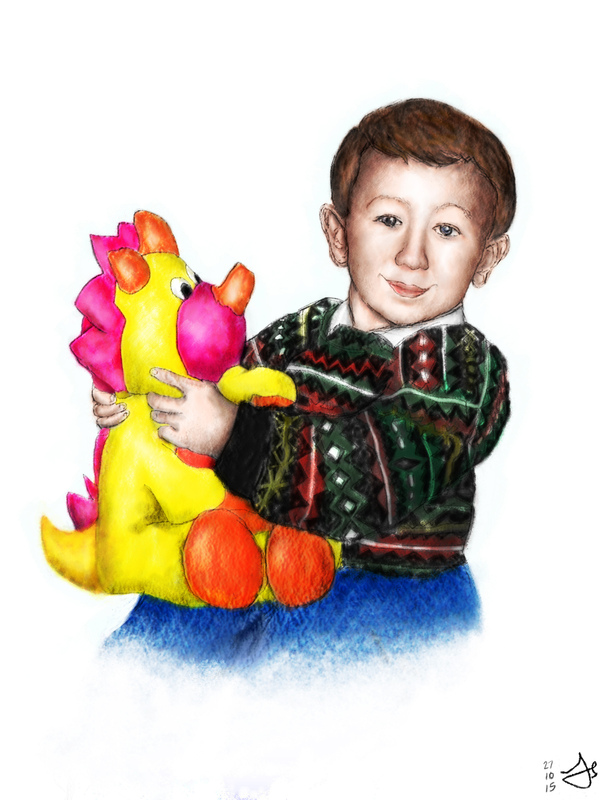 I don’t think I’ve sketched a child for a very long time, certainly not for a couple of years at least. Infants are quite a different kettle of fish to adults, and it can be easy, if not going carefully enough, to turn a fresh-faced kid into a shrunken, haggard grown-up. 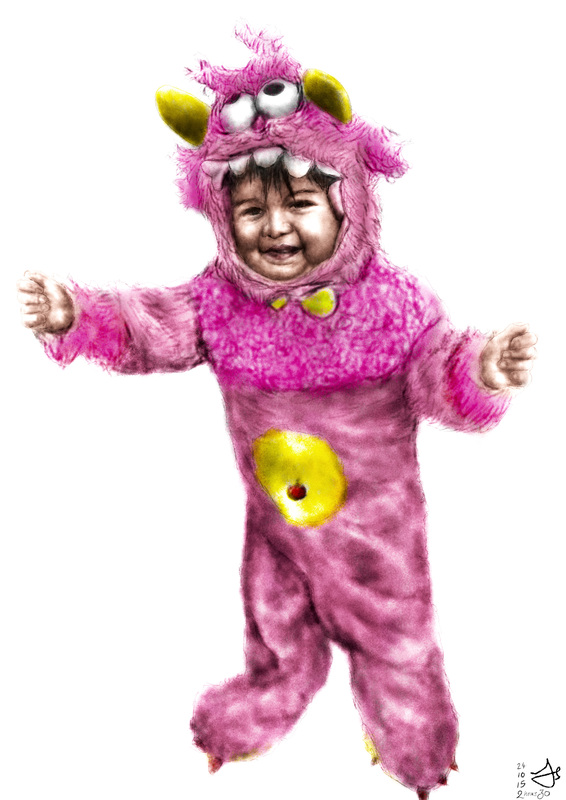 With that peril in mind, I spent more than half the time doing and redoing the child proportions – thankfully the costume was a bit of a safety net here, but not much – and working on the face. After a little while looking quite a way off, I managed to coax the childlike smile out of the subject. Thank goodness I had all that time to get it right! With the longer time, this also allowed me to use colour, which I haven’t been able to do for a while in these tests. Again, I’m pleased that could be so – you couldn’t really forego it here, could you? That’s the scary ticking clock out of the way for another week! Seeing this cute shot rather makes me regret never giving much of a hoot about Halloween as a child… I want a costume! (huffs) Well, actually, there was one: a friend’s party shortly after the event circa 1998, where I dressed as the devil and was plastered in glittery make-up, but I won’t be drawing that any time soon. You don’t really think you’ll win, do you? 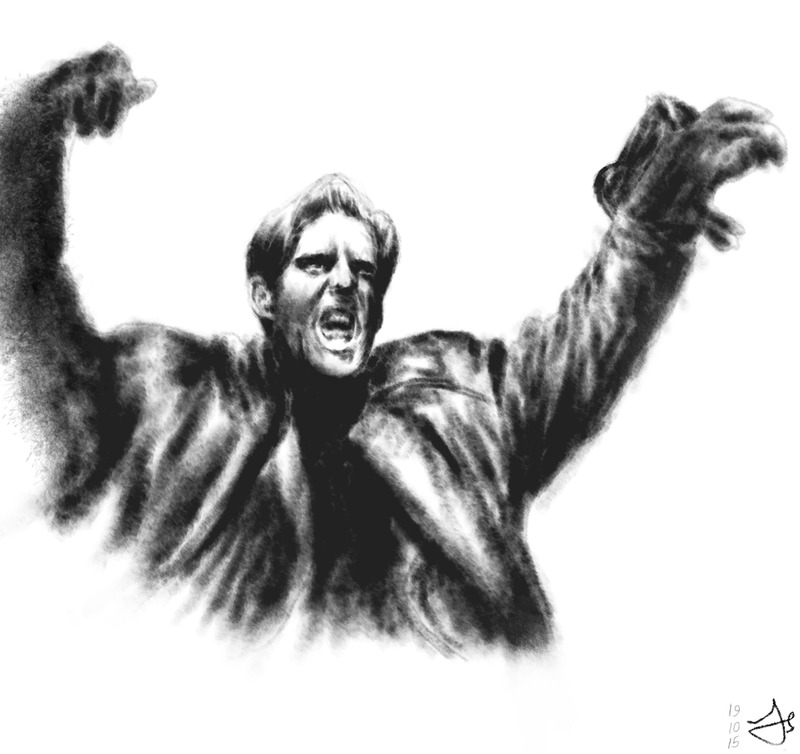 This is a quick sketch of Sean O’Kane… oh, I’m sorry, Interceptor – that’s actually his name, right? – the star of ITV’s surefire hit, Interceptor… or not so surefire a hit, as it happens; it only lasted for eight episodes in 1989, and then vanished altogether. I don’t know why that is. I concede that is terrible, but at the same time, I think it one of the most hilarious television programmes I’ve seen. It’s a couple of years before my time, but we had a recording of the episode shot just minutes from us, and I must have watched this single programme several thousand times as a youngster. It was a theatrical mutation of Channel 4’s seminal hit Treasure Hunt (which I will probably weave into a drawing some other time, as it was another show I loved). In Interceptor, two contestants were loaded with a briefcase-style backpack each; one was stuffed with £1,000, the other just weighted to feel that way. The pair were then blindfolded and dropped off by helicopter several miles from each other, in an area they presumably had no previous knowledge of. They not only had to meet up in forty minutes, using bulky communications equipment and the questionable guidance of screechy host, Annabel Croft, who stood out in the middle of nowhere with a giant map trying (and usually failing) to keep things orderly, but they also had to at some point ‘win’ the key to their co-contestant’s backpack. When both keys were won, all they needed to do was reunite, open the packs and collectively cry “jolly d!” at having won £500 each. However, making every effort to thwart them in their quest is THE INTERCEPTOR, a leather-clad Glaswegian with his own ominous black-and-yellow chopper to hover back and forth between the contestants’ journeys. He was not limited to the air, though; the highlights of the programme were the various hammed up ‘ambushes’, where he came down to ground level and pursued his hapless targets by other means; scaring them silly by jumping out from behind a wall, catching them in a hedge maze, or taking the driving seat of their own transportation… none of it at all staged, of course… and very often making hilarious bird of prey cries in their faces. His main goal, though, was to ‘zap’ one of five ‘receptors’ on the back of the backpacks, using a snazzy laser gun contraption stuck to his arm – if he struck accurately, the pack would become stuck shut – even the key won’t unlock the cash, so contestants were best to keep these targets away from the Interceptor at all costs. Given how many times he got a clear vantage point throughout the series, he must either have been a lousy shot or the 80s technology was letting him down, because he frequently seemed to have hit perfectly, then the contestants got to the end and still managed to open them! Interceptor garnered decent ratings and yet never returned, apparently a casualty of both its considerable production cost and changes within ITV over that period. You wonder if it might have enjoyed a longer life had it been on Channel 4 – it feels more their kind of thing in its kookiness. It was very of its time in that I couldn’t imagine the concept being touched with a bargepole in today’s era of shoestring budgets, even though there is a loyal following still clamouring for a second series, and I believe a genuine gap on TV for something of this adventurous and outlandish nature. I wish I could have gone on it. It would have been hilarious. 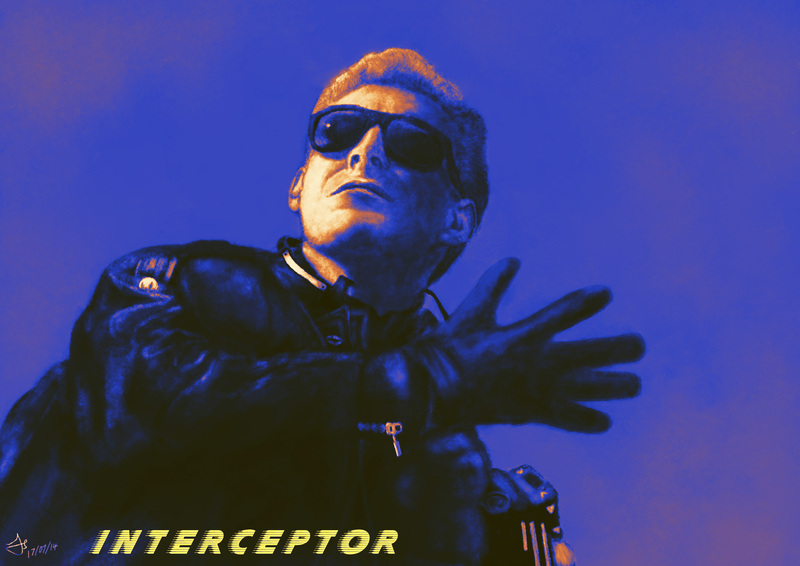 It seems appropriate with this post to show this, even if some fifteen months late: for Interceptor‘s twenty-fifth birthday last summer, I made this, finished with a helping hand from the Photoshop Gradient Map tool. Do you remember me saying last week about how seriously I was taking these timed practices? Well, it got to 5 o’clock this afternoon and I’d completely forgotten to do or even prepare one. That’s dedication for you. NEVER MIND. 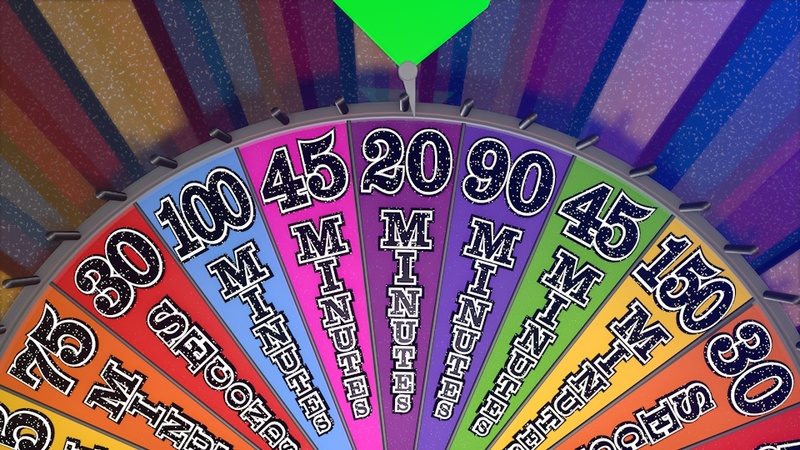 It’s Saturday, and, as is now a long-standing tradition, I treat myself and spin a colourful and sparkly wheel that doesn’t actually exist. This week it gave 45 MINUTES to try and complete a drawing from the Reddit community. Reddit Gets Drawn throws up so many intriguing shots of a fantastic range of models – I highly recommend it to anybody who wants to practice portraiture. That being the way, there were so many potential candidates for this week, but the fantastic hair of this woman ultimately won me over. As the clock ticked, my confidence in it swung back and forth, but I think considering some of my longer challenges that have preceded, it has turned out quite well. Maybe these exercises are beginning to pay off! There are areas of shading that need more care – most of the neck, the chin, the ear – and I didn’t get to do much with the hoodie, but I did better than expected with the time afforded. To be honest, I was just itching to get to the hair… it was a lot of fun, and I just wish I could have spent longer on it! There are some marvellous and far superior answers to the submission pitched by other users of the Reddit. Do go and have a look at them! Until next week – if I remember!